Tangy barbecue sauce adds the perfect touch of flavour to this quick-and-easy stir-fry recipe- the perfect dish to serve on a busy weeknight. 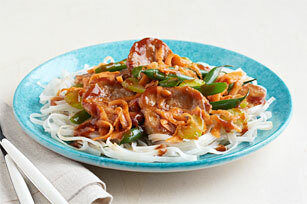 Make our Spicy Pork Stir-Fry recipe a new family tradition. Meanwhile, toss meat with cumin. Heat 1 Tbsp. oil in nonstick wok or large skillet on high heat. Add meat; stir-fry 3 min. or until evenly browned. Remove meat from wok; set aside. Heat remaining oil in wok. Add vegetables; stir-fry 2 to 3 min. or until beans are crisp-tender. Return meat and any meat juices to wok. Add barbecue sauce and water; stir-fry 1 min. or until heated through. Substitute regular fettuccine for the rice stick noodles.